Just like most of you reading this blog, I’ve been through quite a few towels over the years and I’ve barely noticed the majority of them. I’ve had a few towels that I liked because of the styling – but I don’t remember a single towel that left me saying “wow – this towel works really well.” In most cases I don’t think much about the towel except in those horrific situations when I lose them. Well, rest assured, there actually are some good towels out there on the market. The Club Glove Caddy Towel is one of those great towels that does the job extremely well and also has a great minimalist design. To start with – the Caddy Towel is big. 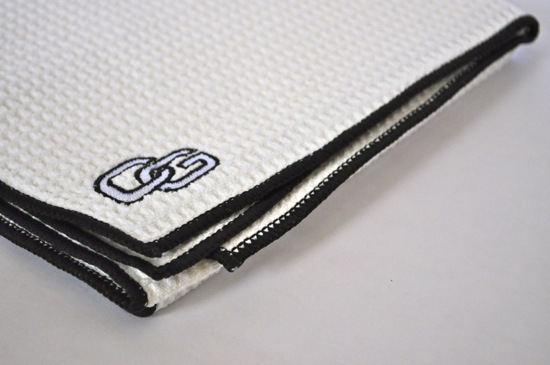 It’s about twice the size of standard club-issue golf towel which it makes it the perfect size (17″ by 40″). I typically find myself slinging the towel around my neck (assuming it’s clean) while walking to the green and I love that it can double-over in the towel loop on my bag. I often clean my clubs as I’m walking between shots – so it’s nice to have the versatility with the extra length. 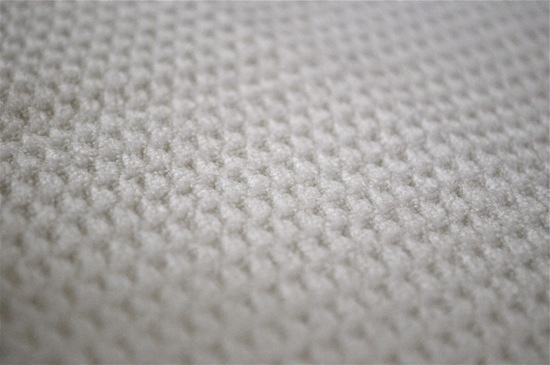 The towel is made out of microfiber so the feel of the towel is a bit different than a typical golf towel. The waffle pattern on the towel is unique and does a great job of confining dirt. I’ve been using two different Caddy Towels and both have held up to typical wear-and-tear and each has cleaned up with a simple cycle through the washer. The Caddy Towel has an opening in the middle of the towel that can be used to drape the towel over a club so that it stays put in your bag without having to rely on a towel loop or any clips to keep it in place. This is a nice aspect of the towel and I love the versatility that it offers. Hanging the towel on your bag – especially while walking – is much less of a chore with the hole in the middle of the towel. The towel has great absorption capabilities that come in really handy when you’re cleaning your clubs. My local muni doesn’t have a club-washing station and my typical routine is to soak about 1/3rd of the towel in water in the clubhouse and clean my clubs off when I return to my clubs outside. Partially soaking part of the towel offers enough moisture to clean your clubs while you can still use the rest of the towel to dry the clubs off. 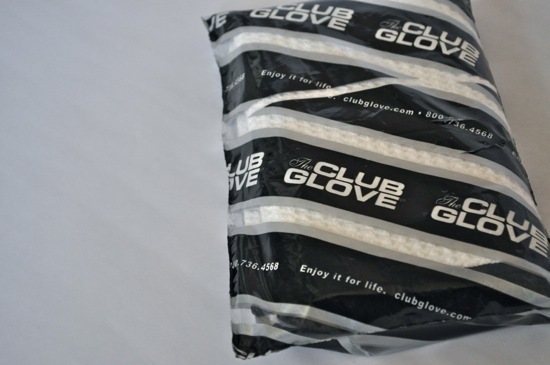 ClubGlove offers the Caddy Towel in a variety of colors and also has the ability to customize your towel with a few different logo options when your purchase directly through their website. If you’d like to see more images of the Caddy Towel, you can check out more photos in full-resolution in our Club Glove Caddy Towel photo album on Facebook.